Starring: Leonardo DiCaprio, Tom Hardy, Domhnall Gleeson, Will Poulter, and more. There is something about the Oscars season that I just love as a film lover. The films that are chosen for the Oscars are most of the time the cream of the crop and cause audiences to feel emotions rarely felt when viewing the typical movie. In recent past, movies like ‘Birdman’, ‘12 Years a Slave’, ‘Argo’, ‘The Artist’, and so many other HUGE movies have shook the film world and grabbed audiences by the throat, commanding attention with every passing second. Now, for the 2016 Oscars, the predictions are coming in full force for what films are to be among the next Oscar contenders, and one of the front runners? Alejandro González Iñárritu, the director of the 2015 best picture winner, ‘Birdman’, presents his next masterpiece, ‘The Revenant’. 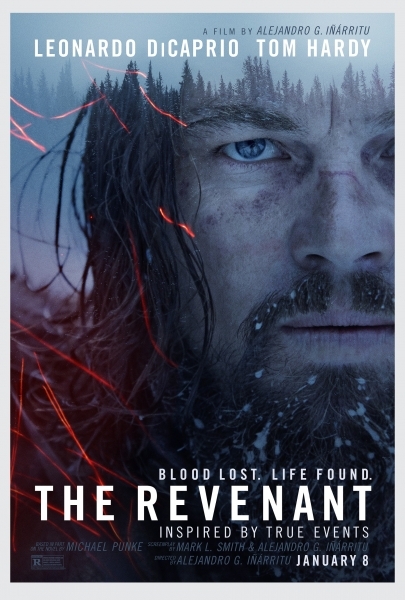 ‘The Revenant’ is the survival story of the legendary trapper of the 1800′s, Hugh Glass (Leonardo DiCaprio). The film sets off following Hugh and his group of trappers collecting pelts for trade. This group is led by Captain Andrew Henry (Domhnall Gleeson) and also consists of fellow trappers, Bridger (Will Poulter), John Fitzgerald (Tom Hardy), and also Hugh’s son, Hawk (Forrest Goodluck) among many others. While the group is in the process of collecting pelts, they are suddenly attacked by a local Native American group, causing them to collect what they can and escape the attack all the while losing many men part of their group. During their retreat, the group devises a plan that keeps them as safe as possible from further attacks while also creates a long and dangerous trek for them to take on the way to civilization. While on their journey to safety, Hugh is mortally wounded by an attack which puts him near death. The group is then faced with life threatening decisions in regards to what to do about Hugh, where to go, to split up or not, and many others but regardless of the decision, the story now focuses on Hugh and his survival as the audience witnesses him go to great lengths rarely ever seen before to live and ultimately get revenge for certain decisions made by members of the group. I will not sugar coat my opinion section for this movie. This film left me stunned, grinning from cheek to cheek as it ended. The cinematography is absolutely stunning. There are scenes when there is simply just a shot of clouds moving or trees swaying in the wind with just the sound of Hugh breathing happening and they are some of the most powerful yet simple moments I have ever seen. Leonardo puts on such a performance that some may even forget him as an actor and simply feel the struggle he is portraying as he grips onto survival. Tom Hardy puts on an absolutely stunning performance as well, further solidifying him having a remarkable 2015 year in film. Alejandro puts together yet another masterpiece in every aspect imaginable. There is not much more for me to say. I will have a spoiler section farther down in this article so if you have seen it, please feel free to scroll. Otherwise, I recommend everyone to see this film. Whether you are a casual entertainment fan or one of the biggest movie buffs, this film would grab everyone’s attention and have them gasping for a breath at the intensity this film presents and how epic the project is in general. So, welcome Revenant fans and maybe some haters? (I hope you don’t exist, if so, let’s talk) Here’s some huge key points I personally thought were astounding within the film… Again, if you don’t know what “Spoilers” mean, it means if you did not watch this movie yet, get the hell out of this section. The quote I used specifically is HUGE to me as it seemed to have a major point in keeping Hugh alive. Since before the bear attack, (which I will also get to) Hugh faced a life trial of losing his wife and almost losing his son. Her words was the exact quote I used above and the exact quote that is repeated a couple of times in the film. As long as he was breathing, he was to keep fighting and so he breathed, even after the bear attack, after the mortal wounds, after the weather conditions, after the starving conditions. With every breath, he fought, all the way until he got his hands on Fitzgerald. The symbolism behind this quote and how it fueled Glass I thought was a very key and impressive part of this film. The bear attack was wild. It was quite possibly one of the most intense moments I have ever seen in film and among everything it seemed insanely real. There was no Hulk strengthened human being holding a bear by his jaws, no one trading blows with the bear, it was simply a human man being mauled by a grizzly and playing dead so he can get a moment to gather his next move against the grizzly. Hugh was faced in this moment to either die or survive, and he survived. I would love to get more information about his this shot was done. Tom Hardy has had a remarkable 2015. With his performance in ‘Mad Max’, a fan favorite and sure-fire iconic movie to come with time. Also not to forget his performance in ‘Legend’ and even dating further back than 2015, Tom has stunned in recent years and this performance falls no where near short of his growing talent. I found myself hating Fitzgerald. His character of Fitzgerald was despicable but that can be reflected back to how well Tom did this character. Fitzgerald was making a living, by any means necessary. He was a survivor himself just in different ways than Hugh. As much as Leo deserves credit for his role, Tom deserves just as much for his. The shots made for this film were absolutely stunning. From the running waters, to the close-ups of animals, to the swaying trees, to the vast woodland areas. I was floored by how beautiful each and every shot was. I have always been a fan of Leo’s and yes, I am an advocate for the “Get Leo an Oscar” Fan Club but I will just make this brief. With the portrayal of Hugh Glass, teamed up with the powerhouse that is Alejandro, along with this talented cast. If there was ever a performance for Leo to get everything he deserves, it is this performance, this film.